Falsifications of the leading "Historian" from the Republic of Bulgaria - republic-of-macedonias jimdo page! "The History science have concluded before long time that the Ancient Macedonians were a Greek tribe, and whose territory till the fourth Century BC was encompased in Modern North Greece." But the opinion of Bozhidar Dimitrov have evolved. In the Bulgarian news paper Standard from 13th August 2006, Bozhidar Dimitrov have changed the descend of the Ancient Macedonians in DISTINCT NATION who was RELATED to the Thracians and Illyrians, and whose Macedonian State was NEIGHBOR to Greece. игри - макар и ученик на самия Аристотел, той не е грък." "The History science have concluded before long time that the Ancient Macedonians were a tribe, related to the Thracians and Illyrians. Their Kingdom was placed direct to the Ancient Hellas(Greece) ... So forus there are no doubts - it is apperant that that even Alexander the Great was refused to take part in the Olympic games - and though he was descipel of Aristoteles, he was not Greek." First of all, it seems that for Bozhidar Dimitrov the History science have for a long time concuded what the Ancient Macedonians were, even though it is something which he is not really certain of it what it really was. In one case he claims that one thing and than he claims the total oposite thing. But this does not prevent him of claiming that all this is already concluded by the History Science. But someone would say, "hey don't be so harsh on him"! Well let us say that at this point Bozidar Dimitrov was correcting his past errors related to the Ancient Macedonians. How ever, this man have proven that he does not do anything by chance, and certainly not out of Scientific reasons. 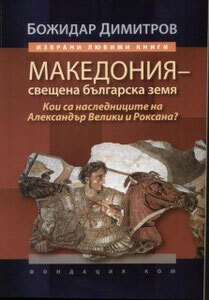 His last Book "Macedonia sacred Bulgarian Land" with it's subtitle "Who are the real descendants of Alexander the Great and Roxan" is the last far cry to the Bulgarian state to Bulgarize the Macedonians. In his above mentioned Book now he states that the true descendants of the Ancient Macedonians are in reallity the Tatar Asparuch and Krum, the so called Proto- Bulgarians who are very little blood related to the Modern Bulgarians. Bulgarians prove to be the guilty of forgery of History, as tool for Bulgarization of the Macedonians.